Since flashing ARHD this morning I haven't seen anything or experienced anything different than the usual. 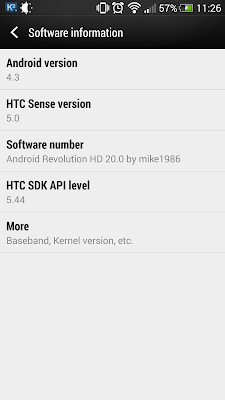 I did note that it's snappy with its current stock kernel. As you can see from the above screen capture I haven't changed any of the settings. I've installed as is. I've been playing around with the current settings and what not and been figuring out if I could see anything different beside what we know is under the hood of this release. Everything to this point is fluid, smooth and looks really nice. There's been no boot issues, no hotboot, no full restart, no errors noted on the screen or in the logs, sound is awesome, picture quality is top notch etc. This list a lot of the changes that were made by Mike. It's about that time of the day nearing lunchtime, I'm at work playing around still and I can't seem to find any reason for not being on this release. I'm trying hard to find things that don't work well, causing issues or just plain glitch O rama. Not having any luck. So the difference between this current release and the 4.2.2 of ARHD that I was on earlier is the Bulletproof Kernel I was using which gave me the snappy feeling. While on that kernel I was running on a lower clock speed while the phone was dormant, which helped me get a better battery life. I also had other features such as logo double tap to wake or swipe left to right to wake and swipe right to left to sleep vs using the power button at the top. I do miss those features from the kernel. 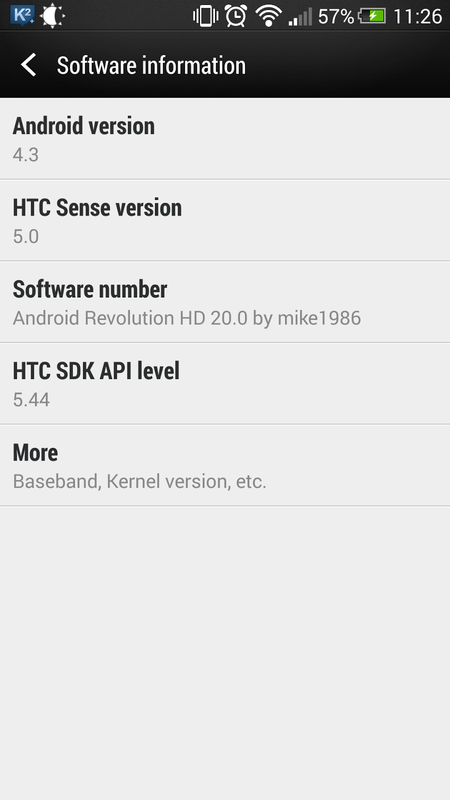 If this could be included in the stock kernel I don't see why I would change the kernel. Knowing that the Bulletproof kernel is develop by Mike as well I may just end up switching the kernel again once I see the release for ARHD 20.0 JB 4.3 I'll more than likely swap for it. As you can see for yourself, there's nothing that can sway me away from this release it's doing a great job. One of the features I've turned off and that's just because it could be a battery killer, is in the Location settings; Wi-Fi scanning always available. Why would apps needs to be able to access the Wi-Fi scanning while Wi-Fi is off? Since location is acquired VIA other sources. All I can come up with is just to accurately position you; it's doing a fine job as it is in the city so it's turned off. I'm charging my phone to the max and I'll actually play around and see how the battery life is with the regular usage I make of it. Now, mind you the regular usage for me is heavy texting, screen time on Google+, Facebook, little to no phone calls and instant messenger type. There's also quite a bit of Dropbox, Google Drive, playing around with settings, home screen and icons themes. Let's not forget that there's a bit of Candy Crush and Diamond Dash as well. I normally get a good 16hrs out of the device before having to actually plugging it. To get a good feel for how I'm using the battery and getting proper stats for it, I'm using BetterBatteryStats from XDA.